This is another theory as to the theory of the timeline of Terminator Genisys. Cause many people doubt the statement by the writers since their explanation is illogical and out of the range of the Terminator series. Some sources even say the movie is actually a reboot, which would offend me. Again, my initial problem with the movie is the fact that Skynet assimilates Connor before he had a chance to send back Uncle Bob, the Terminator in T2, which seems to retcon T2. I have come up with a theory as to how this movie connects with the previous ones. Now it’s safe to assume that this movie retcons Rise of the Machines and Salvation, but how does T2 play into this series? This is my theory, that the future war we see in Genisys is not in fact the war we have seen in the flashbacks of T1 and T2, but a different future established after the Terminator and the Connors destroyed Cyberdyne in T2. It’s a similar future, but not the same. Possible evidence to this theory is that Kyle still had the snapshot of Sarah right before going back in time, when we saw that picture burn in a flashback in T1 way before he traveled back in time. Though this could’ve been a continuity error or if the sources are right about it being a reboot then it doesn’t matter if the picture was still intact. I’m using this element as the evidence that connects the first two movies, cause you’d have to be insane to retcon T2. 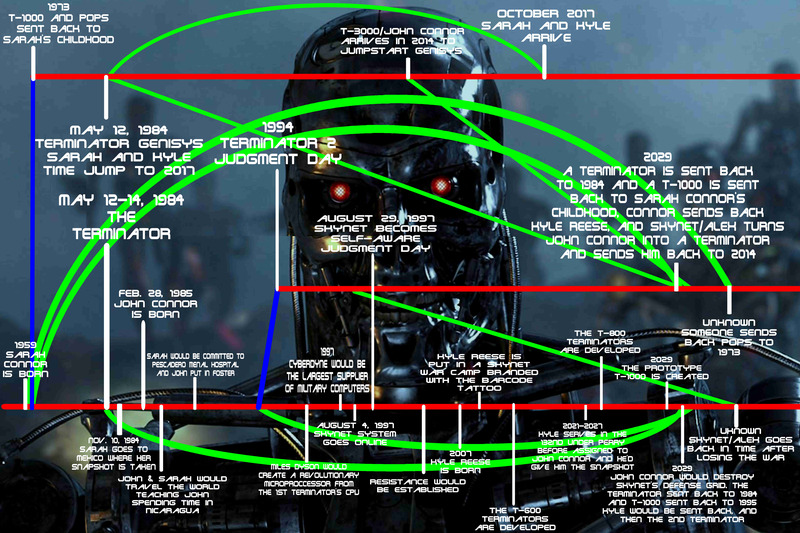 This is the timeline I have drawn up that connects The Terminator, Terminator 2: Judgment Day, and Terminator Genisys. This is the theory I’m sticking to, until the writers confirm this theory or if a sequel to Genisys is made and elaborates it more clearly. Again, maybe it’s just a reboot.